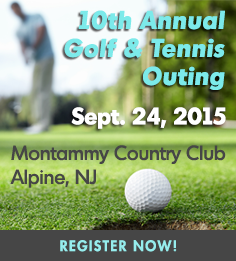 September 24—10th Annual Golf & Tennis Outing: Jointly hosted by ABI, the New York Institute of Credit, and the Northeast Chapter of the International Factoring Association, this event will include a shotgun golf tournament and a tennis tournament, followed by cocktails, dinner, and awards at the Montammy Country Club in Alpine, N.J.
November 19—Mid-Atlantic Endowment Wine Dinner: Please join the ABI Mid-Atlantic Region Endowment Fund Committee for a multi-course wine-pairing dinner featuring the wines of Le Cadeau Vineyard in Oregon. 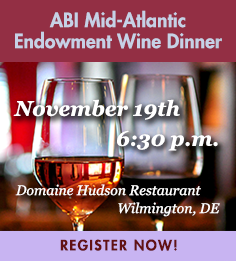 The event will be held in Wilmington at Domaine Hudson in conjunction with the Delaware Views from the Bench Program, being held on Monday, November 23rd. Thank you to our sponsors Gavin/Solmonese and Polsinelli. If you are interested in sponsoring, please contact Sharisa Sloan at ssloan@abi.org or 703-739-0800. Both of these events are great opportunities to network with colleagues in the bankruptcy and insolvency field and, more importantly, to support the Anthony H.N. Schnelling Endowment Fund. Donating silent auction items is a great way to support the Endowment! Don’t know what to donate? Possible items have been selected and are available for purchase at Amazon.com under a special ABI Wish List. Look for the silent auction this summer at upcoming conferences such as the 20th Annual Southeast Bankruptcy Workshop and the 11th Annual Mid-Atlantic Bankruptcy Workshop. Thank you to the following who generously donated items for the auction at the 21st Annual Northeast Bankruptcy Conference and Consumer Forum: Rafael Zahralddin-Aravena (Elliott Greenleaf), David Struyk (Vision Creative), Kevin McGee (Law Office of Kevin C. McGee), Lance Wickel (Epiq Systems, Inc.), Mark Powers (Bowditch & Dewey, LLP), Dan Politzer (Chrysalis Management), Mike Carey (Tranzon Auction Properties) and Elisa Sartori (Mesirow Financial Consulting, LLC). We would also like to thank participants in the last two auctions held at the Central States Bankruptcy Workshop and the 21st Annual Northeast Bankruptcy Conference and Consumer Forum: James E. Busk (High Ridge Partners, Inc.), Judy B. Calton (Honigman Miller Schwartz and Cohn LLP), Daniel F. Dooley (MorrisAnderson), Seth A. Drucker (Foster Swift Collins & Smith P), Matthew T. Gensburg (Dale & Gensburg, P.C. Bankruptcy & Litigation), Bruce Goldstein (MorrisAnderson), Stephen M. Gross (McDonald Hopkins LLC), Beth E. Hanan (US Bankruptcy Court), Patricia Lynnette Higgins (The Law Offices of Roger Higgins, LLC), Tina L. Hughes (High Ridge Partners, Inc), C. Daniel Motsinger (Krieg DeVault LLP), David M. Neff (Perkins Coie LLP), Mark A. Randon (US Bankruptcy Court), Claire Ann Resop (Steinhilber, Swanson & Resop), Michael P. Richman (Hunton & Williams LLP), Brian L. Shaw (Shaw Fishman Glantz & Towbin LLC), John H. Squires (Springer Brown LLC) and Barbara L. Yong (Golan & Christie, LLP). He has joined the ranks of major donors, whose names are among a special group dedicated to advancing research of interest to the bankruptcy community.